The launch of the San Francisco Opera Season is always a grand affair – three consecutive days of festivities starting with the annual Opera Ball and the opening production of the Fall Season on Friday, another first night on Saturday, and the annual free Opera in the Park on Sunday, featuring some of the conductors and soloists who’ll be seen throughout the Season. Opening this evening, September 7th, with the traditional double bill of Mascagni’s Cavalleria Rusticana and Leoncavallo’s Pagliacci, the Company’s Fall Season features a lineup of fabulous productions – including Donizetti’s Roberto Devereux, a new production of Puccini’s Tosca, Strauss’ Arabella, the West Coast Premiere of Jake Heggie’s It’s a Wonderful Life, Bizet’s Carmen, Handel’s Orlando and Dvořák’s Rusalka. 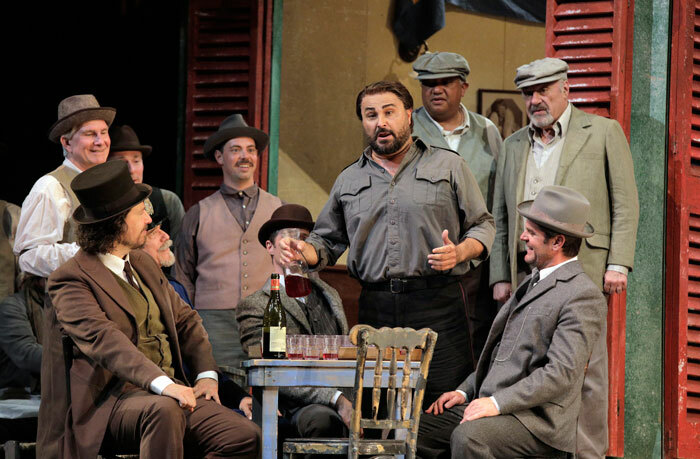 It’s 15 years since Cavalleria Rusticana and Pagliacci were last presented at the War Memorial Opera House, and this new production for San Francisco Opera is by the Argentine tenor, conductor and director José Cura – making his Company debut. Described by Seen & Heard International as “a polymath, a Leonardo da Vinci of our time”, he has set both operas in the La Boca neighborhood of Buenos Aires, well known for its colorful architecture and live tango displays. Also making his San Francisco Opera debut in these performances is Italian conductor Daniele Callegari, whose opera repertoire includes Bellini’s Capuleti e Montecchi, Norma and La sonnambula, Bizet’s Carmen, and Donizetti’s Elisir d’amore, Lucia di Lammermoor, Lucrezia Borgia, Les Martyrs and Maria Stuarda. Italian composer Pietro Mascagni is probably best known for his role in introducing the concept of verismo to the world of opera in the latter part of the 19th century. Already popular in theatre, verismo reflected the lives and passions, violence and honor of everyday people – as opposed to the somewhat distant existences of royalty and the gods – and it accentuated the importance of emotion over beautiful sound. 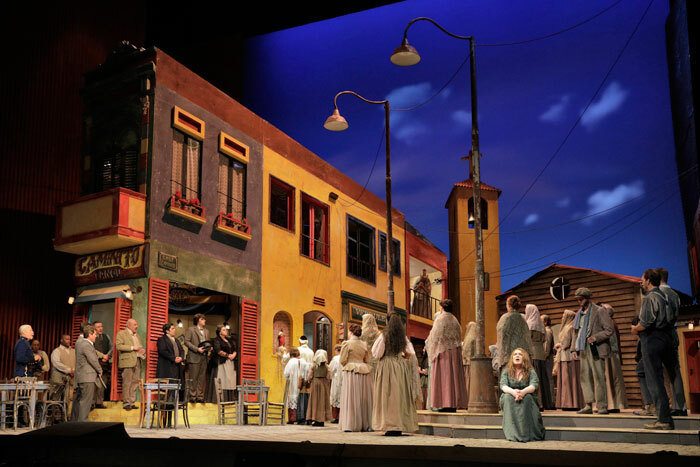 Cavalleria Rusticana, with a libretto by Giovanni Targioni-Tozzetti, is based on a Sicilian melodrama by Giovanni Verga, and tells of the soldier Turiddu who returns from military service to find that his fiancée, Lola, has married Alfio, a well-to-do wagon owner and driver. In an act of revenge, Turiddu seduces Santuzza, a peasant girl, and Lola becomes so jealous that she starts an adulterous affair with Turiddu. 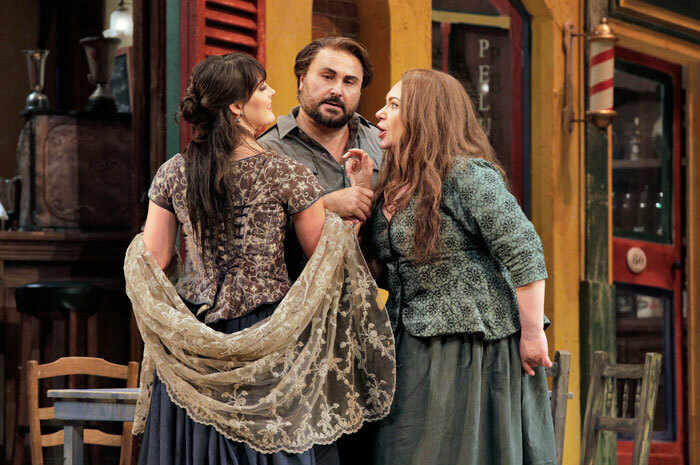 Santuzza publicly betrays the pair, Alfio challenges Turiddu to a duel, and Turiddu pays for his actions with his life. This one-act opera – which was composed for a competition held by the music publisher Sonzogno – was written in a hurry, and Mascagni was ultimately too nervous to submit it, but his wife did so on the last day of the competition. 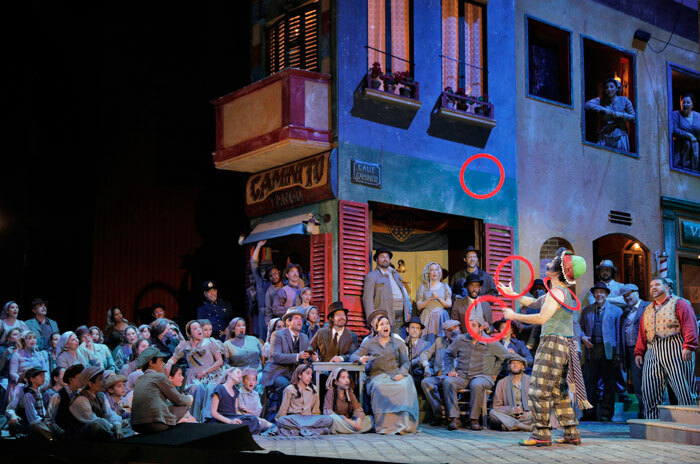 Although Cavalleria Rusticana opened to a half-empty house at the Teatro Costanzi in Rome, on May 17th, 1890, it was rapturously received, and has retained its popularity ever since, often being performed in tandem with Leoncavallo’s Pagliacci. Mascagni went on to succeed Arturo Toscanini at La Scala Milan, in 1929. In this San Francisco Opera production, Russian mezzo-soprano Ekaterina Semenchuk sings the role of Santuzza. Having made her debut with the Company as Federica in Luisa Miller in 2015, Ms Semenchuk returned in 2016 in the role of Amneris in Verdi’s Aïda. A specialist in the 19th-century dramatic mezzo-soprano repertoire, her recent engagements include Eboli in Verdi’s Don Carlo at Teatro all Scala and The Royal Opera House, Covent Garden; Azucena in his Il Trovatore at Rome Opera, the Mariinsky Theatre in St Petersburg and The Royal Opera; Fricka in Wagner’s Das Rheingold at the Edinburgh International Festival; and Lady Macbeth in Verdi’s Macbeth at Los Angeles Opera, opposite Plácido Domingo. Italian tenor Roberto Aronica returns to the War Memorial Opera House in the role of Turiddu. He debuted with San Francisco Opera in 1993 as Rodolfo in Puccini’s La Bohème, and he has more recently appeared in the title role of Don Carlos at the Royal Opera House, Manrico in Il Trovatore at the Teatro Comunale di Bologna, as Pinkerton in Puccini’s Madama Butterfly at the Gran Teatre del Liceu in Barcelona, Calaf in Puccini’s Turandot at Turin’s Teatro Regio, and Alfredo in Verdi’s La Traviata at the Metropolitan Opera. Greek baritone Dimitri Platanias makes his Company debut as Alfio. A gifted linguist, Mr Platanias is known for the rich quality of his voice and for the insight which he brings to his interpretation of the roles he portrays. Among his recent successes are his debuts at the Bayerische Staatsoper in the title role of Verdi’s Simon Boccanegra, and in Nabucco at Palau de les Arts Reina; his performances as Iago in Otello at Oper Frankfurt, Tonio in I Pagliacci at the Osterfestspiele Salzburg and at The Royal Opera House, Covent Garden (both released on DVD), and as Alfio in Cavalleria Rusticana. The role of Lola is sung by former San Francisco Opera Adler Fellow, mezzo-soprano Laura Krumm, who has has appeared on the stage of the War Memorial Opera House as the Second Maidservant in Strauss’ Elektra, Javotte in Manon, Rosina in Rossini’s The Barber of Seville for Families, Countess Ceprano and a Page in Verdi’s Rigoletto, and a Maid in the world premiere of Tobias Picker’s Dolores Claiborne. Mezzo-soprano Jill Grove, who appears as Mamma Lucia, last appeared with San Francisco Opera in 2017 in the role of First Maidservant in Elektra. She has previously performed with the Company as Madelon in Andrea Chénier, and Grandmother Buryjovka in Janáček’s Jenůfa. Ruggero Leoncavallo was a contemporary of Mascagni, and following Mascagni’s success with Cavalleria Rusticana, wrote his own one-act opera in similar style, and submitted it to Sonzogno. Pagliacci – meaning ‘clowns’ or ‘players’ – tells of a performance by a troupe of traveling actors in which the action mirrors what turns out to be a real-life drama, and in which each of the leading players plays a role similar to that of his or her actual counterpart. Canio is head of the troupe, and married to Nedda. Tonio, a clown, is attracted to Nedda, but she’s involved in a clandestine affair with the villager Silvio. They plan to run away together, but Tonio tells Canio what Nedda has planned, and Silvio manages to escape his wrath. This actuality is similar to the plot of the play, and at this point in the performance, Canio forgets that he’s on stage and insists on Nedda divulging the name of her lover. She tries to continue with the performance, and another actor, Beppe, steps in to prevent Canio from killing Nedda with a knife. Her lover Silvio arrives on the scene, and Canio in his anger stabs both of them. 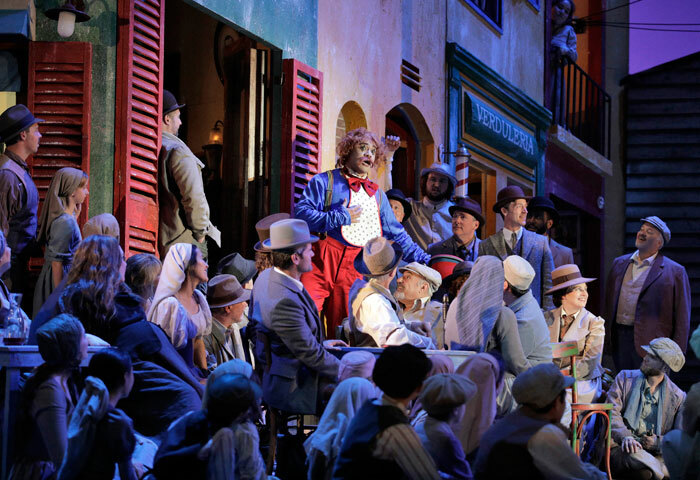 Pagliacci premiered in a hugely successful performance in Milan, on May 21st, 1892, with Arturo Toscanini conducting. In this San Francisco Opera production, Armenian soprano Lianna Haroutounian sings the role of Nedda. Regarded as one of the world’s leading interpreters of Verdi and Puccini, she appeared in the title roles of Aïda at Madrid’s Teatro Real, and Tosca at the Palau de les Arts Valencia during the 2017-18 season. During this last season, she also made her most recent appearance at San Francisco Opera, in the title role of Madama Butterfly, with which she made her debuts at Seattle Opera and the Staatsoper Hamburg. The role of Canio is taken by Italian tenor Marco Berti, admired as an exponent of the Verdi repertoire in roles such as – Radamés in Aïda, Riccardo in Un ball in maschera, and the title roles in Ernani and Otello – and that of Puccini, having appeared as Des Grieux in Manon Lescaut, Pinkerton in Madama Butterfly, and Cavaradossi in Tosca. He has also received acclaim for his interpretation of Don José in Bizet’s Carmen, as well as Canio in Pagliacci. 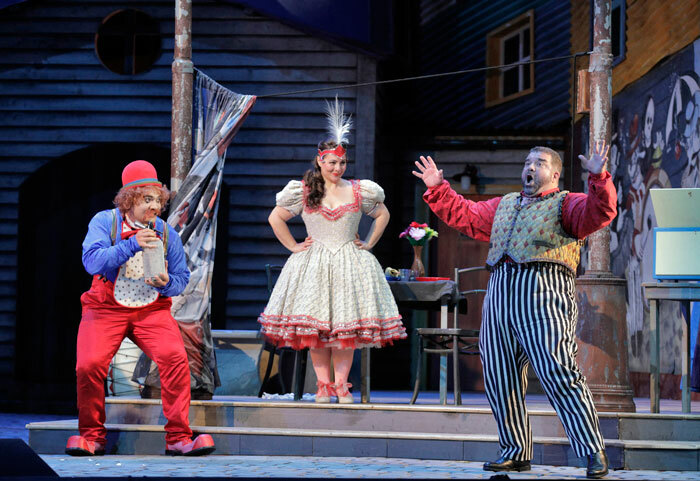 Dimitri Platanias makes his second appearance of the evening as the clown, Tonio, who betrays Nedda and Silvio’s relationship to Canio. The role of Silvio is sung by American baritone David Pershall, whose most recent appearance for San Francisco Opera was Lescaut in December 2017, following his 2016 debut with the Company as Roucher in Andrea Chénier. Mr Pershall is a graduate of the Merola Opera Program, and has appeared at the Metropolitan Opera in the title role of Rossini’s Il Barbiere di Siviglia, as Schaunard in Puccini’s La Bohème and Lord Cecil in Donizetti’s Maria Stuarda. Beppe is sung by New Zealand tenor Amitai Pati, a participant of the 2016 Merola Opera Program, during which he performed his first principal role as Ferrando in Mozart’s Così fan tutte. An experienced choral singer, he has performed and toured with the New Zealand Youth Choir, Graduate Choir, and the Auckland University Choir. Amitai Pati will appear in two other San Francisco Opera productions this season – as Lord Cecil in Donizetti’s Roberto Devereux, and in Heggie’s It’s a Wonderful Life. 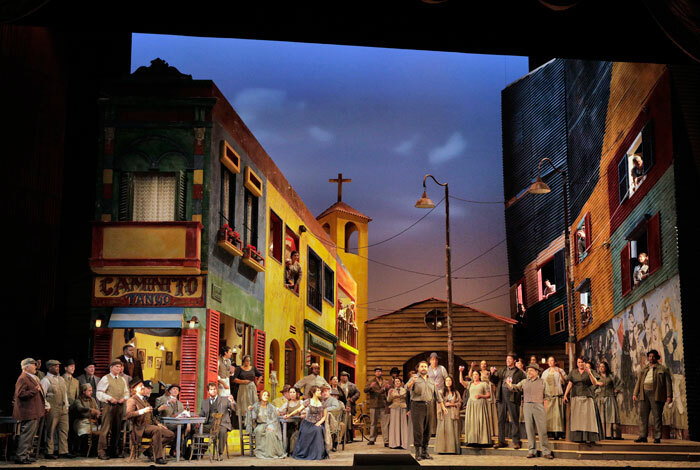 Daniele Callegari leads the San Francisco Opera Orchestra and Chorus (Director Ian Robertson) in the United States premiere of José Cura’s production of Cavalleria Rusticana and Pagliacci, staged in revival by fellow Argentine stage director Jose Maria Condemi. This Opéra Royal de Wallonie-Liège production is sung in Italian with English supertitles. Performances take place at the War Memorial Opera House between September 7th and 30th. For more information and tickets, visit the San Francisco Opera website.